Blackberries are in season right now! I got a pint from a local farmers market with a grab bag package they do. The blackberries sat in the fridge for a few days, and I was really stumped. Cobbler was the first idea that came to mind. Personally, cobbler is one of my favorites. One morning while the blackberries were the fridge and I was browsing what was already in the fridge to see if I could use any of it for any of my meal plans before heading to the grocery. I found on the door, 4 jars of jelly! One of them was blood orange, and I had a light bulb moment. Blackberry + Blood Orange would be amazing! It really was amazing, a bit tart for my taste but nothing a scoop of ice cream can’t help with. It is also super simple! Toss the blackberries in a sauce pan with the blood orange jelly. Use Medium to medium heat. 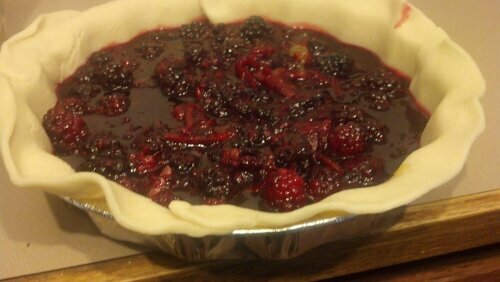 You want to get the pot boiling and the jelly liquefied.Prep your crust in a pan. Lower the heat on the pot. 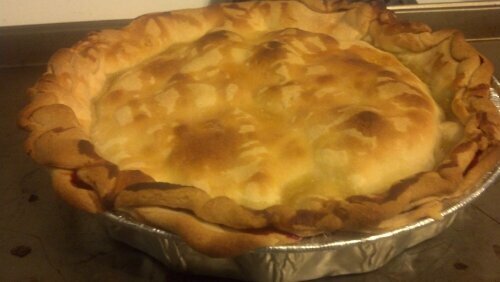 Once the mixture is not boiling pour it into the pie pan. 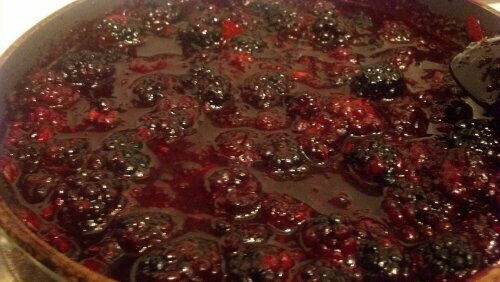 Liberally drizzle honey over the top of the berries with jelly mix. Cover with another pure crust and bake according to crust instructions. – I bought the blood orange jelly from World Market. – Again this pie is tart, so vanilla ice cream or whip cream really helps sweeten this dish.